Spacious pitch cut through the long grass, alongside tall gorse hedges for shelter, surrounded by beautiful countryside views. Only 8 other secluded pitching spots across two fields. Spacious pitch in wild wooded area of the site, low in the shelter of the valley. 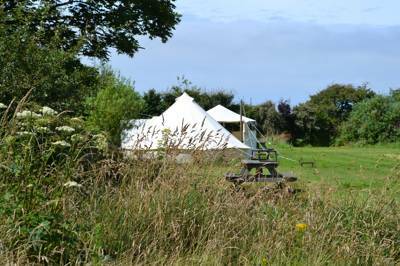 Surrounded by beautiful countryside views, only 4 other secluded pitching spots dotted amongst the Ash wood and Gorse. 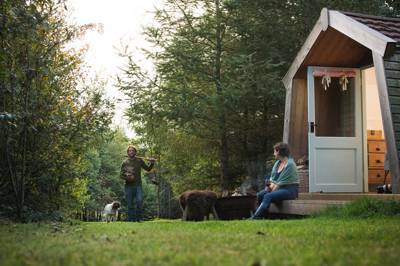 There’s a scrapbook at Bôn Camping where guests can note the wildlife they’ve seen or heard as they explore its diverse 29-acre space. There’s a wide variety of species in there too, scrawled in pencil and pen among the pages. It’s a good indication of what this place is all about. Campers take up only a small proportion of the space on offer here, with over two thirds of the campsite covered by woodland, and it’s wildlife that seems to rule the roost. Fiery yellow gorse bushes and blankets of mature trees are an attraction to campers and critters alike. And thankfully, Bôn Camping can accommodate them both. In total there are just nine, grassy, non-electrical pitches spread across the two meadows behind Porterswell Farm. 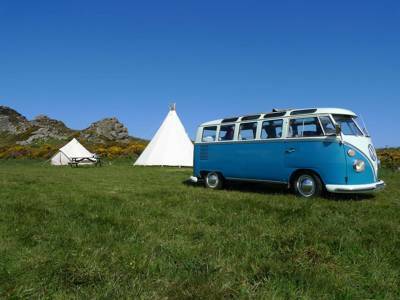 They’re accompanied by a classic 1970's Mercedes caravan for glampers, and simple, eco-friendly facilities. Loos are of the composting kind, while the showers too are entirely off-grid but gas-powered to provide good pressure and hot water. 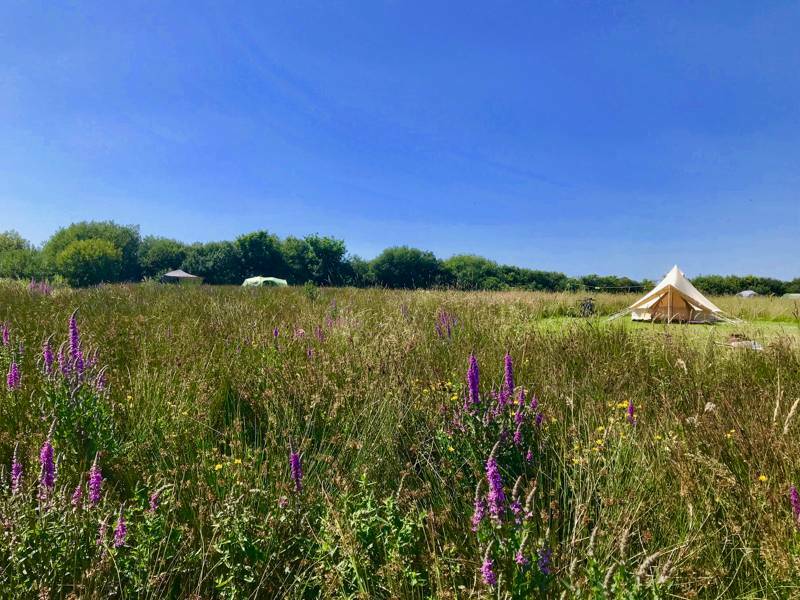 There is a farm barn that has been converted into a communal area with sofas and a dining table, with electricity providing for fridges and freezers, but otherwise the campsite is a rather unadulterated scene, where you can simply pitch your tent as you please and enjoy the natural environment. 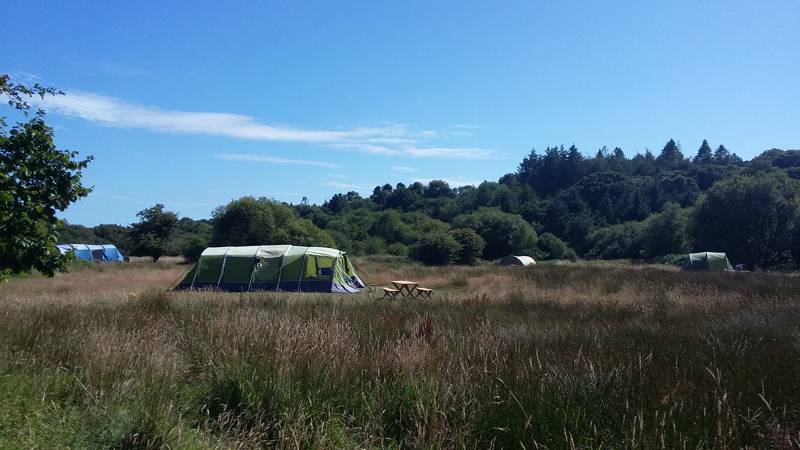 The best place to start is by exploring the woods or heading out on a circular walk from the campsite, either along the Brandy Brook Valley or east to Newgale Beach, one of the best Blue Flag beaches in Pembrokeshire. The latter can also be reached in less than five minutes by car and is popular with families, surfers and just about everyone else who knows a top beach when they see one. Despite this, you can still get away from the crowds if you’re prepared to walk a little from the main car park. There is also the smaller, more sheltered cove of Nolton Haven, perfect for children with its sands and rock pools less than ten minutes away. The ultimate retreat from the masses, however, undoubtedly comes from sheltering yourself away in he semi-wilderness of the campsite itself. Light your campfire, listen to the birds and watch the sun as it sinks its way towards St Brides Bay. After that, you’ll have some of the starriest skies in Wales for extra company. 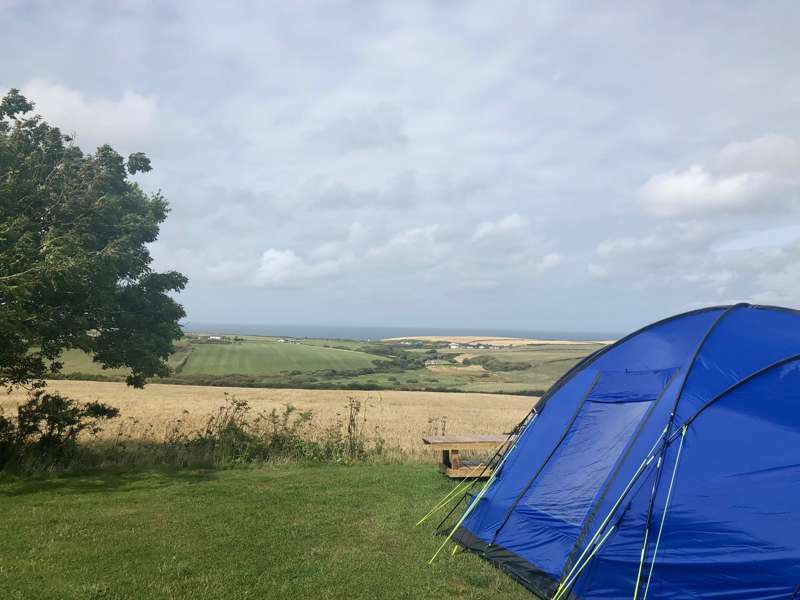 Bôn is field and woodland camping in a 29 acre nature reserve small holding with gorgeous countryside views, so close to the coast you can hear the waves crash on the beach as you fall asleep. Apart from the fields and woods to explore, we have five Icelandic ponies grazing in one field and two very friendly and adorable kune-kune pigs in the other. When it's feeding time for the pigs, kids are welcome to come along and enjoy. Glyn and Gladys love a good scratch! The Woodland pitches are in the lower part of the valley in the shelter of the trees. To get to them, you meander down through the woods until you reach the clearings at the bottom. All pitches are flat and grassy, surrounded by willows, ash, oaks, sycamore and gorse. Plenty of sunshine reaches these pitches and some even enjoy a clear view of the Brandy Brook valley. Wheel barrows are provided to take your gear to the pitches, muscle work at first, but once you're there, it's the most enchanting camping experience there is. Also benefiting from composting toilets, drinking water and washing up sinks. Meadow pitches are where our campsite really started. Located at the top of the valley, each pitch enjoys uninterrupted views across the Brandy Brook valley. Partly sheltered by the tall gorse hedge, new willow trees have been planted around the pitches to create even more shelter. 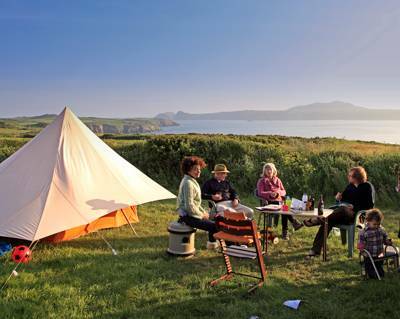 It is possible to have more than one tent pitched up with no extra cost. We now have five pitches spread out from each other with compost loo and washing up facility in the field. All pitches come with a picnic table and fire pit. 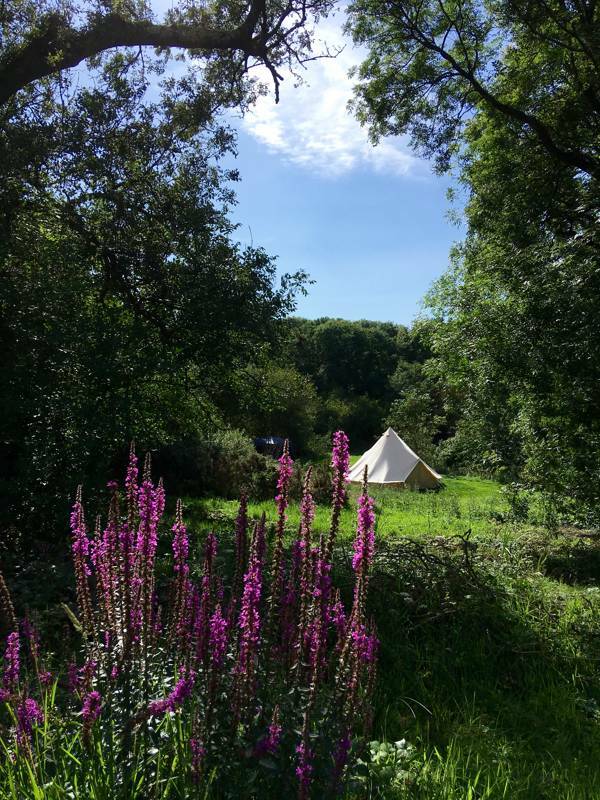 As well as the field and woods camping we also have a couple of bell tents, a yurt and an old Mercedes van for hire, all come with all you need for a luxury stay in the outdoors, with campfires, outdoor seating, fully kitted out kitchens and ensuite facilities with a beautiful countryside view. Our family homestead has 20 acres of wild woodland, teeming with wildlife and bursting with ferns and flowers. The facilities are indoor electric showers, compost toilets and flush toilets all within easy access of your tent, and for rainy days we have a big barn shed with dining area, washing up sinks, fridge freezers and sea kayaks available to use at no extra cost, on a first come first served basis. But remember you'll need a roof rack or a very big boot! 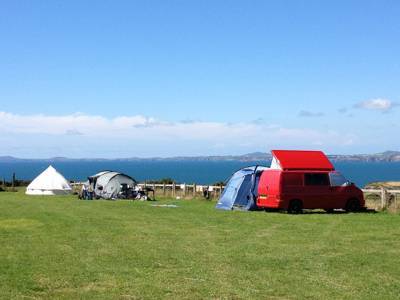 For latest availability and best prices for Bôn Camping, please use the Date Search above. Stayed for three nights in a secluded woodland pitch. The pitches were big enough to fit our massive tent (7.6 x 6.6 m ), and there was a picnic table and firepit (with logs). What we loved was the feeling of being completely away from it all.. It was lovely, no dogs, no traffic, and as we were down in the woodland, our pitch was surrounded by trees so it was almost as if we were the only other people there! We stayed at Bon for 5 nights and were very sad to leave! 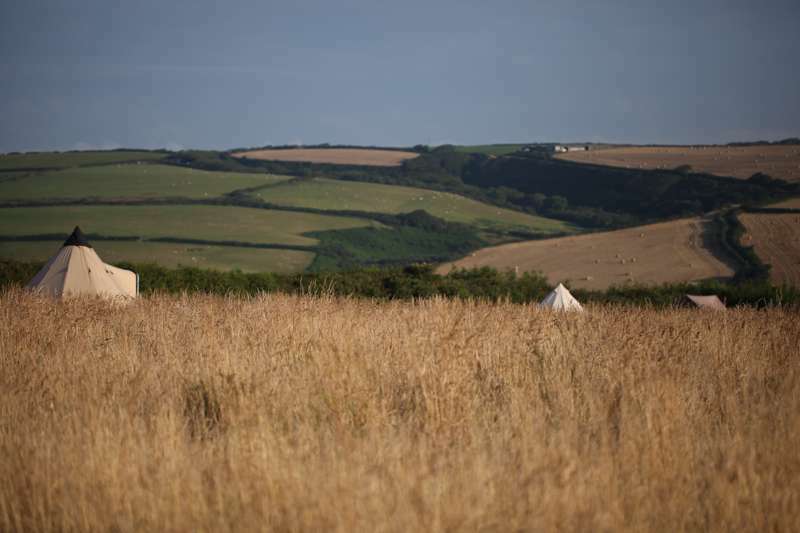 The campsite is quiet and secluded with stunning views across unspoilt countryside - hardly a building in sight. The pitches are extremely generous in size and very private. Fran and Gordon were friendly and helpful throughout our stay, providing us with lots of local knowledge and a wheelbarrow full of complementary firewood. What a wonderful place! We will definitely be back! We stayed almost a week at Bôn camping and it was wonderful. The meadow pitches and views over farmland are beautiful. Fran, Gordon and their little family and are really putting their hearts and souls into this slice of life in Pembrokeshire. Gordon loaded us up a wheelbarrow of firewood which lasted our whole stay and had some super recommendations on things to do for all ages and interests. 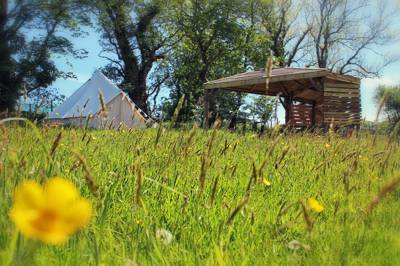 When we come back to Wales we will come back to Bôn camping, there's nowhere we'd rather stay! Also, the showers were incredible! We stayed at Bon Camping for a week and had a fantastic time. Gordon and Fran looked after us from when we arrived to when we departed. With free firewood and their direction we were encouraged to enjoy the walks and the tranquility around their site. They are setting up a low impact campsite which means each site has a large amount of space in which to enjoy the beautiful valley in which the site is located. 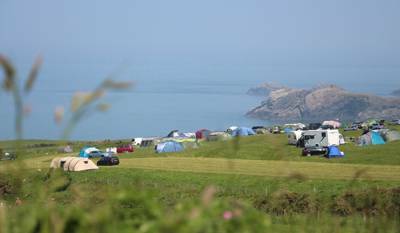 Also its just a quick trip to many stunning beaches particularly at Nolton Haven and with St Davids down the way there is much to enjoy in this area, but you could as easily stay at the site wonder through the local woods. Had such a great week here. Thanks for making our week a special one. We stayed here for a week with two small children and had a fantastic time. It is a quiet site with a limited number of well-spaced, good-sized, pitches of mown grass surrounded by the long grass. We loved sitting around our campfire and enjoying the views. The picnic table and chairs in the pitch were really useful. The kids loved being able to run freely and safely (no cars at the pitches) around the field we were in and playing with the other children. The owners were very welcoming and responsive and made sure that everyone was well looked after. The facilities may be 'basic' but have been very thoughtfully done - the composting loo was no hardship at all and we used the electric showers in the barn which were great. For loading/unloading (just beating the rain in our case!) we were able to carefully bring our car to the bottom of the field and then use the wheelbarrows to get onto and off our pitch but otherwise cars were sensibly kept behind a gate so the site was lovely and safe for the kids and quiet too. The location is very convenient for some great beaches and friendly local villages, the kids especially enjoyed looking in rockpools at Broad Haven. Gordy and Fran were great hosts. We were made to feel welcome as soon as we arrived with a cuppa and a tour :) This is a small campsite so you get your own space and isn't overrun with other people. The view from the hills is as good as the pictures, rolling hills and the sound of the distant sea. Facilities were basic but good. There was a gas hot shower in our field and a composting toilet. Both were clean and the shower was lovely and warm. Cars were not allowed at the pitches, which was a nice touch (increases the feeling of being off grid and having gotten away). The wheel-barrow journey from the car was definitely worth it. Being in Pembrokshire it's very dark at night and we were lucky enough to see the milky-way one clear night. The site is well placed, being close to Haverfordwest and St Davids for main towns. The local villages of Solva and Dale were beautiful. Newgale beach is also only a couple of miles away for some time in the sea or some extreme sports! We will definitely come again for our next trip to West Wales. 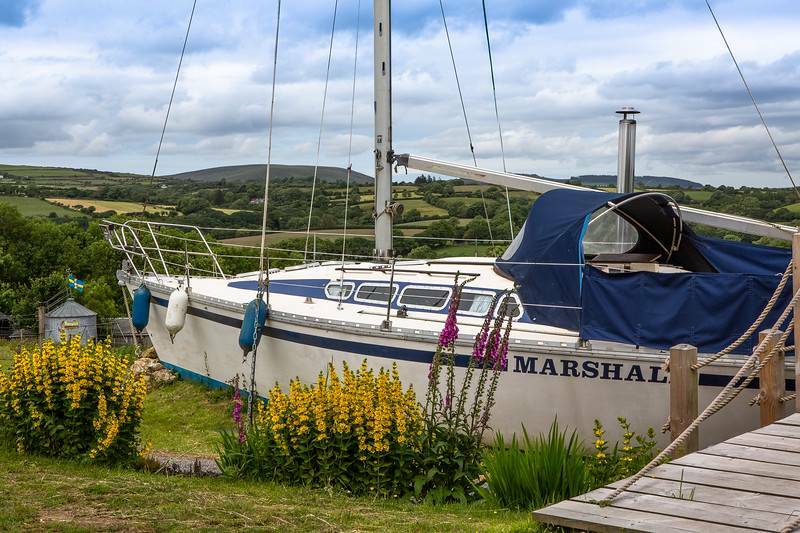 Fran and Gordon are relatively new guardians of this beautiful bit of Wales and have sprinkled a gorgeous vibe across it. They're creating a natural camping environment and are totally committed to seeing that their guests enjoy that full experience. Don't all rush there though, it's our own little secret hideaway! The coast is stunning too. 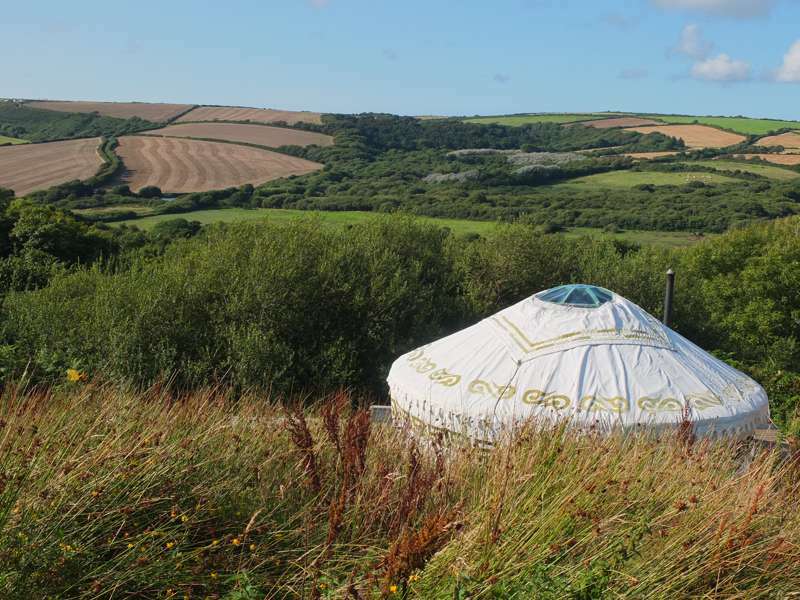 12 meadow grass pitches, (no electrical hook-ups), a 1970's Mercedes camper (sleeps up to 5) and a 5m yurt (sleeps up to 4). Families, couples, and groups of old friends, bring your tents! We are definitely suited to you all. Wild campers - those who love to feel immersed in nature. Those not adverse to pushing a wheel barrow to their pitch! If you believe you might have a noisy group that will disturb others, then it's best not to book with us. It's important we respect one another's camping experience. No dogs are permitted unless they are a guide dog. There are 3 gas-powered showers, 1 flushing toilet, 2 compost toilets and 2 washing up sinks. Communal use of a chest freezer, a fridge and a fridge freezer, plus there's a hang out area in the barn, plus dining table. Campfires are permitted and firewood is available on site. 2 kayaks plus lifejackets available to borrow on a first come, first served basis but remember your roof rack! A 10-minute walk from site there's a playground for those with young kids, 2 public tennis courts and a good pub (see Food & Drink), while you can also walk to the main coastal footpath for longer rambles along the cliffs. Walking from the campsite, there is a magical woodland walk along the ancient Brandy Brook valley. Great for kids. It's a circular walk that takes you past Roch Castle (01437 725566) and back. It takes less than 5 minutes to drive to the breathtaking Newgale Beach, a 2-mile stretch of sand at the heart of St Brides Bay and one of Pembrokeshire’s finest blue flag beaches. It's backed by cafés and places you can hire surf boards, while sea kayaking, and kite- and wind-surfing are also options. The beach is so expansive that there's room for all types though, from family sand-castle building at one end to youngsters riding waves at the other. For a smaller beach, Nolton Haven is only 7 minutes in the car. Our favourite family beach with easy access from the car and a smaller option and good access to coastal walks. Finally, a visit to Hilton Court (01437 710262; 5 minutes by car) is a must. Home to a tranquil woodland garden with its own lake and magical little houses, the place is a treasure trove for a child's imagination, while there is also a on-site pottery studio, a restaurant and a tea room. The famous Melin Tregwynt (01348 891 225) woollen mill is also just 15 minutes drive away. From the M4...Drive on the M4 heading west, then follow A48 to Carmarthen. At Carmarthen you need to follow signs for the A40 towards St Clears and then Haverfordwest. Keep following the A40 all the way to Haverforwest then follow signs for St David’s on A487. After leaving Haverfordwest, you will drive through Pelcomb Cross, Simpson Cross then Roch village. You need to turn left before leaving the village and just before the Victoria Inn. Keep a close look out for the 20mph signs on the left hand turn and drive along Roch Hill between the primary school and the pub. Keep going until you pass the Baptist Church on the left and take the next track road left, signposted Bon, Porterswell Farm. You can also get here by train and bus. Take a train to Haverfordwest station. After arriving in Haverfordwest, you need to get on the 411 bus and head for Roch and ask to get off at Victoria Inn. Walk the rest of the way down the hill or call ahead and Point Farm will be more than happy to pick you up from the bus stop!